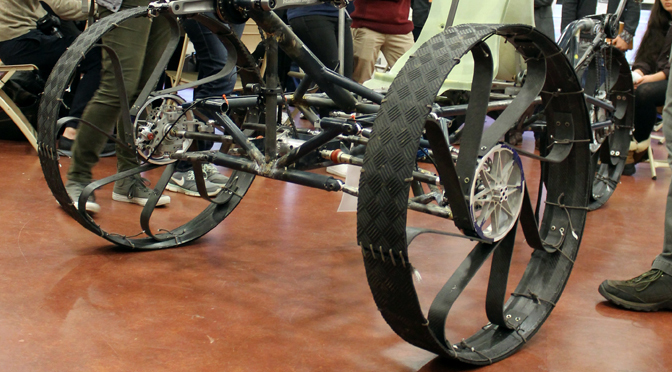 Above, RISD pedal-powered moon rover featuring 13 second deployment time and hand-made tweels. Space Horizons 2016 – International City on the Moon was held February 19-21 at Brown University in Providence, Rhode Island. This year’s topic on building an international base on the Moon was approached as an iterative design workshop involving for separate but related tracks: Business & Technology, Politics, Science and Infrastructure. Space Horizons is an annual conference founded by Professors Rick Fleeter and Ken Ramsley that focuses on near-term but still generative subjects around space with a special focus on relevant topics to students. Past years included Desktop Delta-V which focused on lab-safe propulsion for CubeSats, ChipSat focused on circuit board spacecraft and other topics. In the past it has been a 1 1/2 day conference, this year was a three day workshop run by a student committee and hosting about 80 students and space professionals. It featured the usual faculty from Brown such as Jim Head, Rick Fleet and Alden Richards, a recorded video welcome from the Director General of the European Space Agency, and mentors including Jim Muncy, Olga Bannova, Phil Metzger, Brent Sherwood of JPL, German theologist Michael Waltemathe and others who generously donated their time and talent. Unlike prior years when I have been the only designer involved, this year Professor Michael Lye along with industrial & graphic design students from RISD attended. The designers were critical in creating the dialogic system that enabled rapid iteration across a wide range of subjects that all need to be synthesized for this kind of space project or the workshop itself to happen. The design-thinking techniques employed are based around IDEO practices and include How Might We, the 7 rules of brainstorming, affinity diagramming and others. Two ASU students, myself and Chad Stewart (Aero, ’16) were in attendance. Sunday the ~20 teams presented along with more lectures including Dr. Bannova talking about old Soviet moon plans. Brent Sherwood presented on why Solar Power Satellites are key to further space development by providing Earth with unlimited green energy and energy for space manufacturing and propulsion. Dr. Phil Metzger discussed how to build a self-replicating industrial infrastructure in space that scales like Moore’s Law of computer processing power. 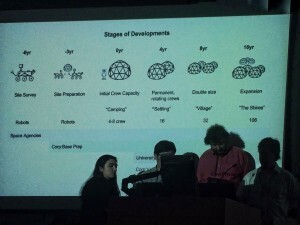 Some of the themes that came up in student and mentor presentations included managing the dust, providing base power systems, recycling of technological and organic nutrients, building domes and other large structures using local materials and techniques such as 3D printing using D.Shape or spinning up a dome using SuperAdobe construction. Specific teams had some interesting results from the research. One Business & Technology team produced a Net Present Value (NPV) rating of an arbitrary-sized Moon base (not full city) of around US $65 Billion. This number can be used as a valuation of potential future value to draw loans and fund aspects of the project. Infrastructure Team 5, consisting of three industrial designers including myself and a medical doctor, produced a planning timeline that tried to bridge the gap in defining the user case between the period when there are 4 government astronauts temporarily on the lunar surface to grow to a community of 16, 32 and 108 permanent residents from different supporting entitites. Our tool tracked base preparation, power systems and mental & physical health evolution as the Moon Village grows from what we called “camping” into “the Shires”. Space Horizons is an annual event, the topic for next year will be announced soon. Infrastructure Team 5 presenting results on a Moon Village planning timeline. Sunday, February 21, 2016. Photograph by Dr. Phil Metzger.